The Mars lander carries a unique instrument that is capable of measuring heat flowing out of the planet. This could shed light on how the Mars' massive mountains, which eclipse Mt Everest here on Earth, first formed, NASA said in a statement. NASA's InSight spacecraft, that has passed the halfway mark to Mars, carries a unique instrument that will enable scientists to understand what geological processes created the massive mountains on the Martian surface. InSight stands for Interior Exploration using Seismic Investigations, Geodesy and Heat Transport. The Mars lander carries a unique instrument, Heat Flow and Physical Properties Package (HP3), that is capable of measuring heat flowing out of the planet. This could shed light on how the Mars' massive mountains -- which eclipse Mt Everest here on Earth -- first formed, NASA said in a statement. "Planets are kind of like an engine, driven by heat that moves their internal parts around. 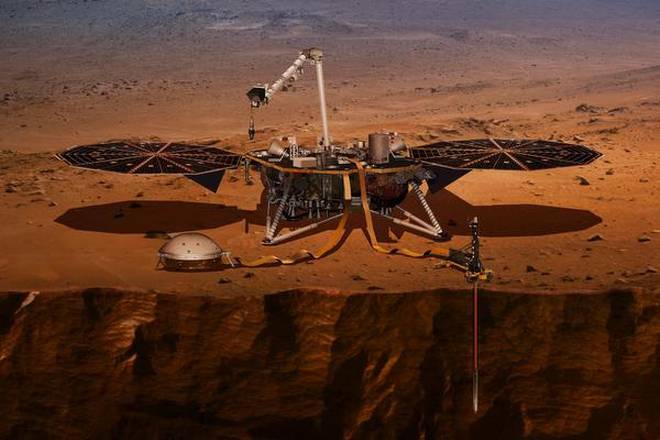 With HP3, we'll be lifting the hood on Mars' engine for the first time," said Sue Smrekar, deputy lead for HP3 at the Jet Propulsion Laboratory (JPL) in California. The Red Planet has some of the tallest mountains in the solar system. They include Olympus Mons, a volcano nearly three times the height of Everest. It borders a region called the Tharsis plateau, where three equally awe-inspiring volcanoes dominate the landscape. "Most of the planet's geology is a result of heat," Smrekar said. "Volcanic eruptions in the ancient past were driven by the flow of this heat, pushing up and constructing the towering mountains Mars is famous for," Smrekar added. The HP3, built and operated by DLR (German Aerospace Centre), will be placed on the Martian surface after InSight lands on November 26. A probe called a mole will pummel the ground, burying itself and dragging a tether behind it. Temperature sensors embedded in this tether will measure the natural internal heat of Mars. The mole has to burrow deep enough to escape the wide temperature swings of the Martian surface. Even the spacecraft's own "body heat" could affect HP3's super-sensitive readings, NASA said. The findings of the InSight mission will also reveal to scientists how all rocky planets are formed -- including Earth, its Moon and even planets in other solar systems.